Frankfurt 2009: Fiat Punto Evo | What Car? Fiat's updated Punto has dropped the 'Grande' badge only to replace it with 'Evo'. Meet the Fiat Punto Evo. Originally, it was the Punto, then came Grande Punto and now we have Punto Evo. The big question is, what's the next one going to be called? The Punto Evo is longer than the model it replaces thanks to the new front bumper. Both that and the restyled grille show the influence of the Fiat 500, while the front and rear lights have also been restyled. 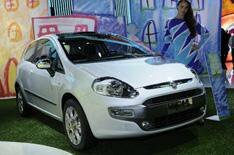 The dashboard, instruments and seats have been redesigned to make the Punto 'more prestigious and elegant'. The full engine line-up has yet to be revealed, but Fiat has confirmed that its cleanest engines those that are Euro V-emissions compliant will come with start-stop systems to cut fuel consumption and emissions. The Punto Evo will come with seven airbags, including a driver's knee airbag as standard. Fiat and TomTom have also developed a portable 'infotainment' system that combines telephone, navigation and information functions in one unit, called Blue&Me TomTom. It includes TomTom's 'IQ Routes' for the fastest route and accurate arrival times, and 'eco:Drive Info' for real-time information on driving style and suggestions for getting better fuel economy. First UK deliveries are expected in March 2010.